After my ski circumnavigation of Newberry Crater three weeks earlier (see trip report), I knew I had to go back soon and ski the steep NE-facing bowl and NW-facing chutes which drop about 1400 vft from the summit of Paulina Peak (7985 ft), the highest point on Newberry Volcano. Paulina Peak (pronounced "paul-eye-na", not "paul-ee-na") is a large lava dome perched on the edge of the caldera of Newberry. The NE Bowl has a pitch up to 40 degrees, while the 3 main NW Chutes reach closer to 45 degrees (and one has an hourglass shape, narrowing to only a ski-width wide). Forest Road 21 into the caldera had just been plowed open in time for fishing season to begin on April 24, thus shortening access to Paulina Peak by 3.5 miles. Snow depth in the caldera (6300+ ft) was generally about 3-4 ft. But I had slept in late, quite tired from skiing Mt Hood yesterday (see trip report), and then I'd spent more time during the morning taking photos of the lakes in the caldera, worried that the day might soon cloud over. I finally parked at 6400 ft at the foot of the Paulina Peak Road and skinned up after 11am, leaving the road after 1/2 mile and taking the more direct Crater Rim Trail to the top. This saves about 2 miles over the 4.5 mile long summit road, but is hard to follow (I mainly just skinned up through the open woods). Views from the summit were spectacular as usual, with the caldera, 2 lakes (one partially frozen), and numerous snowy obsidian flows to the NE and the broad panorama of the Cascade Range to the west, with Mt Jefferson, Three Sisters, Broken Top, Bachelor, Diamond Peak, and many other volcanoes visible. I skied off the summit and down the NE Bowl at 1pm, on very well-softened snow on this warm spring day. Conditions would have been better an hour or more earlier, but snow stability was still OK even on these steep slopes, with only a few small rollers and sluffs. No old ski tracks were visible at all, but surprisingly there was a skin uptrack along the edge of the steep bowl. I skied the upper bowl, then down the steep openly treed slope into the lower bowl, and down to 6600 ft, before traversing a mile back west to rejoin the Crater Rim Trail. I had planned to skin up again and ski the NW Chutes, but the afternoon heat and very soft snow made this a risky plan. Lots of avy debris from the weekend's instability was evident below the NW Chutes (ski tracks were visible in 2 of the chutes), and I wasn't sure if things might still be unstable. So it seemed prudent to call it a short day, and I skied back down to the road and car just after 2pm. Only 1600 vft for the day, too bad I couldn't have gotten going about 2 hours earlier. 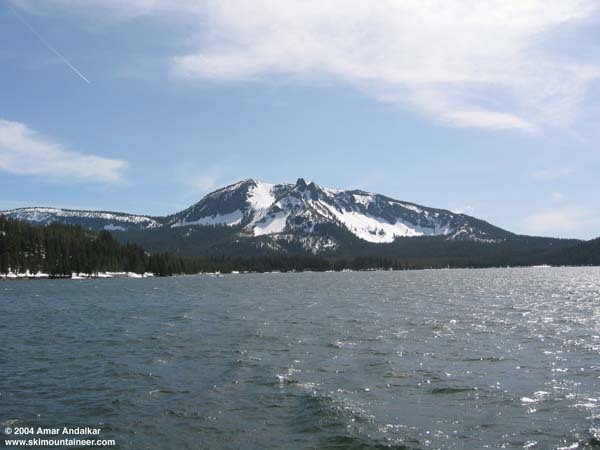 This photo shows Paulina Peak looking SW from the east side of Paulina Lake. Click here for a double-size version of this photo.